A spacious and comfortable contemporary designed villa near Choeng Mon beach, set within lush walled garden with beautiful sea views. Amenities satellite TV/DVD, stereo system with iPod dock, WiFi broadband internet, air-conditioned bedrooms and A/V room, fully equipped kitchen. 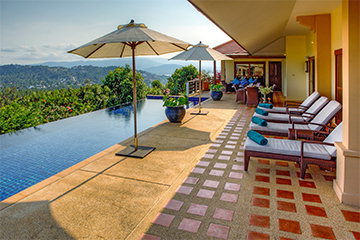 Spacious and charming, Summit Villa 15 is an airy 5-bedroom hillside home designed in contemporary tropical style, with beautiful sea views over Choeng Mon beach, and surrounded by a lush tropical walled garden. Set within a secure gated estate, Villa 15 is conveniently located in the north-eastern corner of Koh Samui, within a short drive of the island’s many attractions. The villa is entered from a private car port to the open-plan living room, which faces the pool deck and infinity-edge swimming pool. The living room features vaulted ceiling, and includes a comfortable lounge, dining table, and fitted kitchen with breakfast bar. Glass doors open out onto the sand-wash pool deck, furnished with a sofa, sun loungers, parasols, and an al-fresco dining set. At the far end of the pool deck, in a private pavilion, is the sea-view master bedroom suite, with King-size bed and an indoor-outdoor en-suite bathroom with walk-in rain shower and a large bathtub. The 4 remaining bedrooms are located on the lower floor, and all are air-conditioned, with ceiling fans, private balconies, and access to the beautifully landscaped tropical garden. There are 3 double bedrooms and 1 twin bedroom, with one double interconnected to the twin room through a shared bathroom. The other 2 double bedrooms are both en-suite with walk-in showers. Also located on the lower floor is a large air-conditioned AV room, with satellite LCD TV/DVD and sound system. The TV den is furnished with a long sofa, coffee table, and scatter cushions. Complimentary WiFi internet is available throughout the property. Summit Villa 15 is a relaxed and comfortable villa for families or groups of friends, and is conveniently located within easy reach of the island’s best beaches and main attractions. Choeng Mon beach is a few minutes walk away, with a shuttle service available at a nominal fee. In-villa chef service can be arranged if required, and there are numerous dining venues and bars within the vicinity, as well as a gym, water-sports, and spas. The villa is located within a secure gated compound with 24 hour security. Summit Villa 15 is located within a minute’s drive of the idyllic Choeng Mon beach, with the tourist Mecca of Chaweng, and the charming Bophut Fisherman’s Village both within 10 minutes drive. Koh Samui airport is 10 minutes drive away. -Minimum stay of 3 nights in standard season, 5 nights during peak and high season dates, except for Xmas/NY, minimum of 7 nights. 15% discount for any booking confirmed within 20 days of arrival. Applicable to 4 and 5 bedroom occupancy rates only, and cannot be used in conjunction with other promotions. Not applicable for Xmas/NY. 10% discount for booking made 150 days or more in advance. Applicable to 4 and 5 bedroom occupancy rates only, and cannot be used in conjunction with other promotions. Not applicable for Xmas/NY.